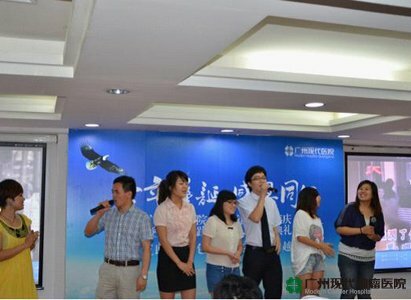 In August 27th 2012, the ceremony of Touched Character Awards for the 2012 Corporate Culture was held in meeting room of Modern Cancer Hospital. Many overseas patients and the staff had actively participated in resulted in a hot atmosphere. 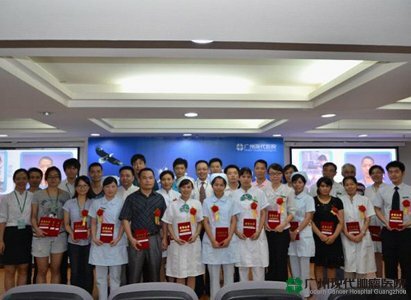 Modern Cancer Hospital Guangzhou has gained tremendous achievement these years due to every hard-working staff. Our team is filled with love, responsibility and mission. In those years, the medical personnel have consistently dedicated themselves to patient service; rear service personnel try their best to support every staff’s work; manager personnel do their utmost to lead us to a bright future, etc. Among them, many touching stories were happened during those years, which reflected the enterprising spirit of Modern Cancer Hospital Guangzhou “mutual help, harmonious tolerance, high efficiency and excellent innovation”. Based on the materials which were collected in over a half month, thirty touched characters were finally selected. This ceremony was held for expressing appreciation to them with award, song and applause , for the interpretation and perception of the hospital culture by their own stories which were full with tears, sweat, toil, grievances and joy, for the brilliant works they made for Modern Cancer Hospital Guangzhou by their enthusiasm and responsible attitude. 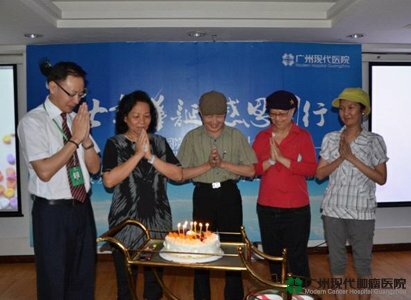 At the end of the ceremony, Director Wang and overseas patients was cutting a cake to send the most sincere wishes to the hospital. We said good-bye to the past honor and saddled mission again. To create more splendid future for this hospital, we still need to go on working hard together in the following days.